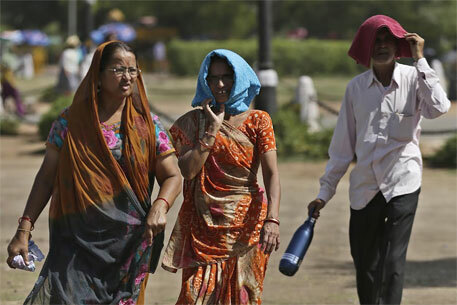 The intense heat wave condition that is sweeping across India could be another manifestation of an extreme weather event, say researchers from the New Delhi-based research and advocacy organisation, Centre for Science and Environment (CSE). About 2,000 people have been killed in India by this weather condition. In the worst-affected states of Andhra Pradesh and Telangana, maximum temperatures have hovered around a searing 45 degrees Celsius. According to CSE, a heat wave is declared when the temperature is five degrees or more than the average temperature recorded on that particular day over the last three decades. Cities feel the brunt of the elevated temperatures, because of the magnified effect of paved surfaces and a lack of tree cover – this is known as the “urban heat island effect”. Climate records show that human-induced global warming had turned 2014 into the hottest year on record. “Eight out of the 10 warmest years in India were during the past decade (2001-2010), making it the warmest decade on record with a decadal mean temperature anomaly of 0.49 °C,” says the CSE press release. CSE climate researchers say more heat waves were expected as globally temperatures had risen by an average .8 degrees in the past 100 years. Night-time temperatures are rising too, with Ahmedabad and Delhi recently reporting 39 and 36 degrees Celsius. “The number of heat-wave days may go up from about five to between 30 and 40 every year,” they add. There is also enough evidence of extreme weather events being on the rise. “This year, we saw the wettest March in about 50 years, and we have already seen the second major flood in Kashmir in a period of six months. These are all extreme weather events,” says Srinidhi. “Additionally, owing to the rising temperatures, ultra violet (UV) rays emerging as a serious menace for people’s health,” says CSE. A recent Down To Earth story had cited data from the Pune-based Indian Institute of Tropical Meteorology (IITM) showing that in several cities, including Delhi, UV rays are above normal. IITM set up a monitoring system in Delhi two weeks ago and has found that UV rays are ranging between six and nine on the UV index – this carries medium to high health risk. Did climate change trigger heat wave in India and other nations in 2014? Heat wave is not a manifestation of climate change -- which you mean global warming. The heatwave condition/cold wave condition are are presented by me in a paper of 1974 -- A method of forecasting the weather associated with the Western disturbances. The Figure 7a of this paper created heat wave conditions in Telangana and then it moved to 7b condition and created heatwave condition in Coastal Andhra. Regarding UV, it is insignificant when compared to visible spectra radiation. Global warming since 1951 to date is 0.15 oC = 0.1 oC. The Indian and Chinese temperature shows an increase in night time temperature associated with urban-heat-island effect. The impact of the same temperature on human life associated with changes in environmental conditions and changes in our food type. Please do not use climate change as an adjective to attract media attention -- I saw this report in Deccan Chronicle.